If I had to pinpoint a time when photography became important to me, it was in Mr. D’Urso’s high school classroom. South Plainfield offered a fair share of electives and I was most grateful for this one because it taught me something magical. It taught me patience and process. Nothing great is instantaneous and that can be applied to everything in life. All of this got me thinking about doing a personal photography project. Something that wouldn’t be a one-off rather a continuing and endless series. I contacted my mentor and got it worked into our schedules. I thought it would be a nice nod if I shot the project on film, so I loaded my Mamiya 645 Pro backs with Fujifilm Pro 400H (color) and Kodak TMAX400 (black and white) and grabbed some of my favorite light modifiers for the Alien Bee ringflash. I often use the ringflash and 56″ Moon unit/softbox. The white side of the softbox is great for portraits because it sculpts the subject nicely in a warm enveloping light. My setup for the portraits is one light with a softbox. Any ambient light is not cancelled out by the light I brought into the portrait. The environment is just as important as the subject, particularly since this is Mr. D’Urso’s actual classroom. There is a lived in and practical use for everything you see around the class. There’s still nothing quite like film. Film for portraits is something that engages the subject. Young and old either remember film or have a fascination that it still exists. It also helps slow down the process so the subject feels comfortable. I can talk to them and at 15 shots per roll, I am not machine gunning every movement. I practice this with digital as well, but it’s even more important with film. It goes without saying to bring along extra backs pre-loaded with film. My developing ritual takes place in my bathtub. Living in a condo doesn’t afford me the space of a proper darkroom. If you are in a similar situation buy a black changing bag and the rest of the usual suspects (developing tank, thermometer, stainless steel reels, etc.) and get cracking! No excuses. 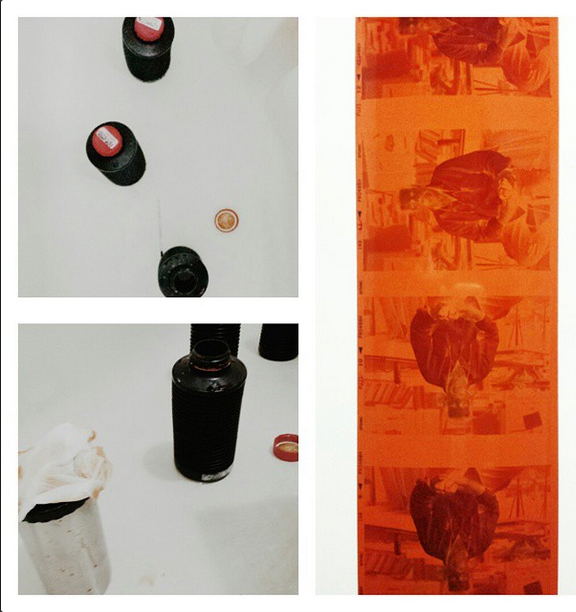 If you have running water, you can develop film. 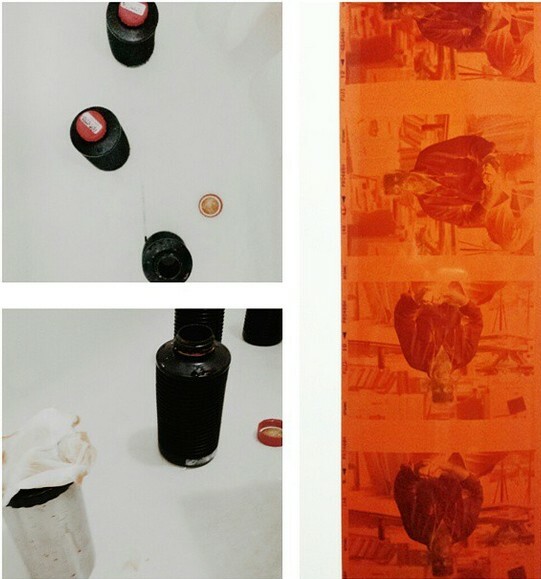 I develop my film in the bathtub. It’s not glamourous, but it works. 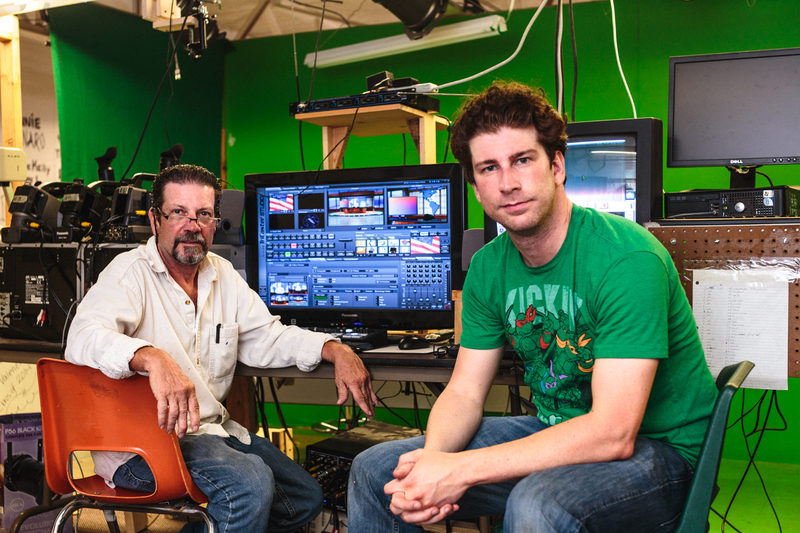 I thought it’d be fitting to have a photo of myself and Mr. D’Urso in the super cool tv station that the high school now uses to broadcast. Real broadcasts that go outside of the building. You can’t stop rock n’ roll or technology. This is one green scene. I always knew my brother-in-aw, Rich, was an inspiration… glad someone else does too. 🙂 Outstanding photos of him. Thank you, Judi, for taking the time to comment. Appreciated! Its always great when former students come back and stay in touch. Its especially rewarding to know that as teachers, we DO make a difference in our students lives!!! CONGRATS TO YOU BOTH! Yes indeed. The great teachers have an impact that lasts way beyond the time spent in their classes. Thanks for the comment, Mike!